This is about my cat. Well, yes and no. It’s about my cat, but like everything else in my life, what’s happening at any given time is more than it appears to be. Especially the things that are disturbing. Those, my dear friends, are always about lessons. Sedona is a place where lessons seem to be more, shall we say…vibrant. This place is not a pink spiritual cloud upon which one floats about in a constant state of bliss. On the contrary. This is where lessons reach the 2.0 level. It’s where things get refined. Back to my cat, Dorian Gray. Dorian and I have been in a struggle ever since we got here, four months ago. He was an outside cat back in Maryland. He was born free, ruled the neighborhood, and hunted like a country cat, which is what he was. I live in a sedate, closed complex here in Sedona, where pets are not allowed to run free. (Somebody told me it’s really about dogs.) 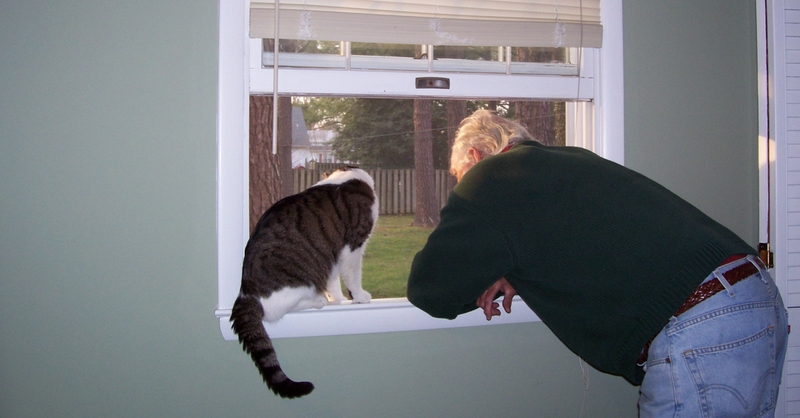 I’ve also been warned about the coyotes, who roam and prey on cats. Successfully. Dorian doesn’t know about coyotes, and has continued to try to get out at night, his hitherto roaming time. I have kept him inside, giving rise to night howls. This other-worldly caterwauling (now I know why they call it that) took its toll on me. I became sleep deprived and irritable. It was like having a hangover. Every. Single. Day. I tried putting a harness on Dorian to give him walks. I got him into it once. We went outside, and he was terrified because he was restrained and couldn’t protect himself like he was used to doing. I tried to take it off, and he scratched and bit me, something he has never, ever done. I had to take him to the vet so that one person could hold him and another person could remove it. I tried the vet’s prescription for Prozac. That turned him into an animal I didn’t recognize – a lethargic little thing with all of the joie de vivre gone out of him. And it tasted like holy hell. (I tried a bit on my finger.) One time, after I administered it (it was a syrup), he foamed at the mouth. That was the end of Prozac by mouth. I tried a cream version that is put on the inner ear. Still not good for this little animal. I tried a natural remedy, a calming botanical, which made him happier. And it had no side effects. We spent a few quiet nights when I actually got some sleep, and then, it happened. Dorian escaped. Now there is no going back. I have a small patio. When I first arrived, I hired a handyman to cover the open fence with chicken wire. I bought more wiring and gerrymandered it all around the top and sides to prevent him from climbing over the first chicken wire. When I was finished, it looked like a crazy person did it. No matter how it looked, at least – I thought – I could give him a place to be with fresh air and sunshine. But Dorian saw it as a cage without a roof. He kept looking for the loophole in my engineering, and finally, after studying it for four months, he found it. When I went out to check on him, he was gone. In a panic, I got in my car and scoured the neighborhood, looking for him. I climbed down the rocky wash in back of my house – something stupid for someone my age to do. I saw him in the wash, Dorian saw me, and he ran. Frustrated, I climbed back up, came home and cried. After a while, he was back at the patio door, crying to come in. Now we come to the lesson. For over four months, I have been suffering with this cat. And I mean suffering, because I love him and I am afraid of losing him. Love? Suffering? They come as a pair, sorry to say. I feel guilty because I have deprived him of the only life he has ever known, and I feel selfish, because I have kept him as my companion, whether he wanted to be or not. I’ve brought him to a strange place and forced him to do his business in a box, which has destroyed his privacy and humiliated him. He lets me know that. To his credit, he has changed a bit. Since we’ve been here, he’s taken to lying on top of me when I watch TV in bed. He puts his little head on my chest and goes to sleep. He’s never been a cuddler, but he’s turned into one. I let him sleep in my bed now since he has no fleas and never gets dirty. He’s become more loving, more endearing, and I’ve gotten more dependent on him to be here with me. This is undoubtedly a trick of the Universe. Something to make the lesson a little more…costly. The day after he escaped, I let him out the front door. After another night of howling, I was angry and woozy, and just wanted some relief. “If he doesn’t come home, he doesn’t come home,” I thought, and I cried again. My neighbor rang my doorbell soon afterwards, and there he was. He had gone to the wrong door. They’re all blue and they all look alike. There is something going on here, and I need to know what it is. That is the key to my spirituality. It’s the seeking, the finding out, the exploration of suffering. I’ve spent a great deal of my life exploring grief. God knows, I’ve had my share of it. If you’re new to this blog, you should know that my seventeen-year-old son died a long time ago, and that my husband died seven years ago. I’ve learned a few things about suffering. But grief, like any other major challenge, has its lessons and gifts. Suffering is part of life on this plane. What’s important to me is to discover how it is working for me and for my soul, which by the way, has ordered these lessons for me. Ah, but that’s for another day, another blog. Dorian, my teacher this time, is showing me what little control I have over things, how I need to stop fighting life and the Universe to hold onto something that really doesn’t belong to me. He is showing me that he, like all creatures, is free to live and free to die in his own way, in his own time. My daily prayer is that God will grant me the serenity to accept the things I cannot change, the courage to change the things I can, and the wisdom to know the difference. I couldn’t hold on to my son, and I couldn’t hold on to my husband, my mother, or my father. I couldn’t keep them with me forever. I couldn’t keep them “safe.” I accepted these things over time, and you would think I’d have learned this lesson by now. Apparently not. This is, after all, the 2.0 version of lesson-learning. I’ve thought about it, and I’ve come up with several reasons why I am trying to hold on to this cat by opposing a Force of Nature. That isn’t even sane. I have bad memories of my first pet and how she died. I vowed that I would not let anything like that happen to Dorian. I made a promise to myself that I am not able to keep. Dorian was my husband’s cat. Am I trying to hold on to him by holding on to the little animal who was so close to him? To let this animal be who he is, who he insists on being, I have to risk going through grief again, something I desperately don’t want to do. There are undoubtedly more underlying factors to understand, but as a friend said to me today, “More will be revealed.” I told her I keep looking for it, and then she said something even wiser: “Don’t look for it,” she said. “It will come to you.” Something else I had forgotten. It is a bright, wintry day here, and I let Dorian out back again. (I still can’t bring myself to let him out at night when the coyotes roam.) He climbed to the top of the wall separating me from my neighbor (I have removed the crazy looking obstacles), held his head up to the fresh air and sniffed. The sky was bright blue and the tree in back was golden in the sun. The breeze lifted his fur, ever so slightly. I don’t think I’ve ever seen him so beautiful or so happy. And then he jumped down, and was gone. Before I went to the movies this afternoon (my wise friend invited me to keep my mind off my suffering), I decided to look a few doors away for Dorian, and I found him. His territory is not that large, at least not yet. There he was, backing out slowly, ever so slowly, from the driveway, his fur fluffed to make him look twice his size. Evidently, he had seen something threatening. I walked slowly toward him, picked him up, and as I carried him home, I whispered into his little face. He looked up at me with gratitude and love. I put him down on the bed and went to the movies. 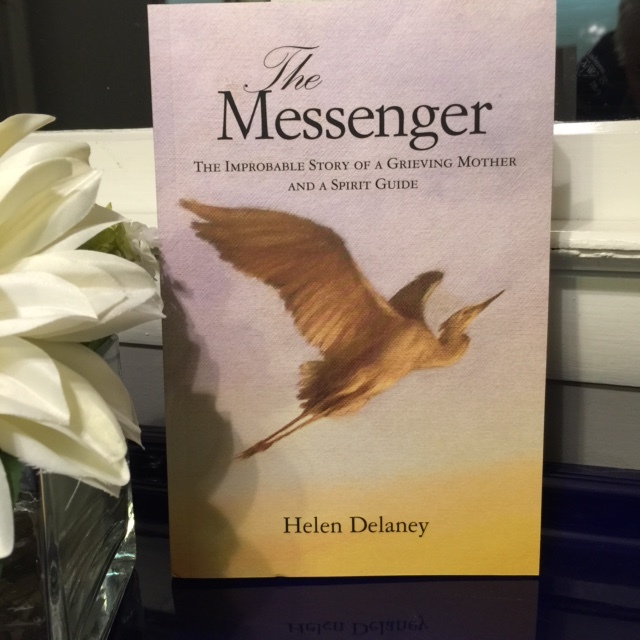 Read The Messenger: The Improbably Story of a Grieving Mother and a Spirit Guide by Helen Delaney. Find it at www.amazon.com or www.themessenger.space.